(Newser) – BuzzFeed is offering a first-ever look inside what it calls "one of Silicon Valley's most secretive and highly valued companies," courtesy of hundreds of internal documents company insiders. 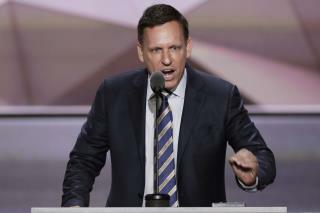 Palantir Technologies was founded by Peter Thiel in 2004, partly using CIA money. The software-making, Lord of the Rings-obsessed company promises it can use data analysis to help business make money and improve espionage. It was valued at $20 billion in 2015—Airbnb and Uber are the only tech startups that have been valued higher. CIA money, as in money that used to be mine? Or is this CIA money that they earned trafficking drugs? The only thing Theil ever really did was ride Zuckerberg's coattails to Valhalla. Does "bookings" have a commonly accepted definition? So far as I know it's just a weasel word that's supposed to approximate revenue. I sold all my stock in one of my former employers when the CEO stopped referring to revenue and started saying "bookings" instead, which turned out to be a good move.